David Finckel and Wu Han are among the most influential classical musicians in the world. Recipients of Musical America’s Musicians of the Year award, they are concert performers, recording artists, educators, artistic administrators and cultural entrepreneurs. David Finckel has received nine Grammy Awards, including two for Best Classical Album, three Gramophone Magazine awards and the Avery Fisher Prize. In high demand among chamber music audiences worldwide, the Finckel and Han have appeared across the United States, Mexico, Canada, the Far East and Europe as they continue their work with The Chamber Music Society of Lincoln Center. In 2003, they co-founded Music@Menlo, an international chamber music festival and institute at Menlo School in the San Francisco Bay area. 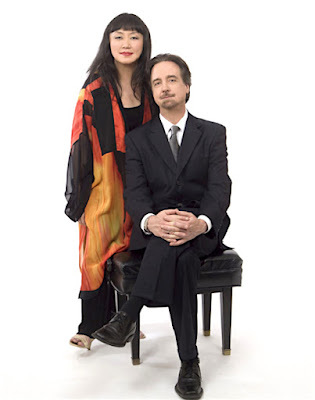 Stay Thirsty Magazine was honored to visit with David Finckel and Wu Han in Manhattan for this insightful Conversation about their music and their views on performing. In the mid-August of 2018, they will appear with the Chamber Music Society of Lincoln Center at the Saratoga Performing Arts Center. STAY THIRSTY: How have your views as performers changed over time? What do you personally gain from performing before a live audience? DAVID FINCKEL AND WU HAN: As technology makes recorded music more and more accessible, we’ve come to value the live performance experience even more. There is no substitute for the thrill of it, and for the communal atmosphere of a concert. STAY THIRSTY: As Artistic Directors of the Chamber Music Society of Lincoln Center (CMS), what are your goals for the next five years? How do you plan to grow the audience for Chamber Music? DAVID FINCKEL AND WU HAN: CMS is very much, at present, on an upward course. We are selling more tickets, reaching more people in New York and on tour, venturing to new continents. Our goal is simply to sustain this growth in all areas, which requires one vigilant eye on the organization as a whole, and another eye on the horizon for exciting new opportunities. STAY THIRSTY: How do you see your role in the training and nurturing of young classical musicians? How do your training ideas differ when working with a technically proficient student vs. a gifted one? DAVID FINCKEL AND WU HAN: We were indeed young classical musicians once ourselves, and we remember vividly our mentors and occasions, such as a performance or master class or even just one thing that someone said that changed our lives. Naturally we put the music itself as a first priority for ourselves and our young players – we make it clear that we are all here to serve the composer. And for student levels: musicians don’t grow at uniform rates. Some are prodigies and some are not, so it’s not what they are doing in their teen, but rather in their 30’s and 40’s that really counts. We simply try to guide all of them to develop at their own natural pace, and feed them all generous helpings of good influence and inspiration. STAY THIRSTY: Live performances are fleeting while electronic recording might last for centuries or longer. How do you see your legacy of recordings and what do you want music historians to focus on? DAVID FINCKEL AND WU HAN: We mentioned recordings before. They are indeed snapshots in time of an interpretation. The great pieces of music – we don’t own them but we are their custodians during our careers. We can leave, through recordings, our own contributions to the evolution of a work’s interpretation, and we think that’s important. We think very carefully about the interpretive decisions we make while recording because it’s our musical legacy preserved forever. A daunting responsibility yet a privileged one to treasure as well. STAY THIRSTY: The Chamber Music Society of Lincoln Center will be performing at the Saratoga Performing Arts Center in August 2018. What drew you to choose Saratoga as a venue and how do you feel about open-air performance centers vs. orchestra halls as the platform for your music? Do audiences react differently in a summer outdoor setting compared to a winter indoor hall? DAVID FINCKEL AND WU HAN: We both love summer festivals – playing in them, programming them, and participating as audience members. There’s a feeling of commitment in the audience: they are really allocating significant free time to listen to music. They don’t arrive having spent a full day at the office – well, not most of them. Their ears are open, and they are in a good mood. It doesn’t matter if they are listening indoors or out, although for chamber music we prefer the intimacy that four walls and roof provide. STAY THIRSTY: What is the relevance of chamber music in today’s fast-paced world? DAVID FINCKEL AND WU HAN: As the world becomes more fast-paced, the importance of participating in, and the appreciation of the arts increases. The performing arts, especially, adjust our sense of time, as does a movie or a play. One can get just as lost in the wonderful world of a Beethoven string quartet as in a play by Shakespeare. Great works of art, whether created during our lives or long before, reflect on timeless realities common to all humankind, reshape them, and present them back to us. Great art is life itself distilled and intensified. Hearing a great piece of music is among the best possible uses of time that a person can find. If one is seeking the best that life can offer, great music provides endless opportunities. STAY THIRSTY: Why are you such a fan of Beethoven? DAVID FINCKEL AND WU HAN: We all have our favorites, but Beethoven speaks especially strong to us. We can’t honestly figure out why, nor express it well in words. Perhaps it is Beethoven’s unique qualities of – often in quick succession – profundity, earthy humor, spirituality, reverence, inner strength and vulnerability that make him so appealing to us. He just speaks to us loud and clear. STAY THIRSTY: If you could have your choice of any cello or piano ever made and speak to any cellist or pianist who ever lived, what instrument would you choose to play and who would you like to have dinner with? DAVID FINCKEL: We already have the instruments of our dreams. My cello by Sam Zygmuntowicz from Brooklyn, made for me in 1993, is one of the greatest cellos I ever played. Wu Han’s Hamburg Steinway D, now finally living with us in Westchester County, continues to be her piano of choice for all our recordings. As for musicians, I know Wu Han would have loved to spend time with Vladimir Horowitz, and for me, if I get to heaven, I’ll seek out Pablo Casals right away.